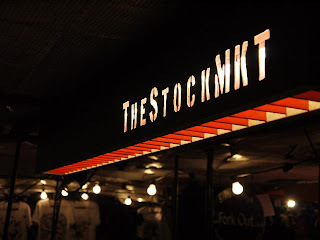 The StockMKT is back for the first Thursday in May (just before the May Bank Holiday Monday) with an appearance in Kingston. Inspired by the night markets of the Far East, it's a mix of eating and shopping, with DJs, and a very cool vibe. "In September 2012 The StockMKT night market debuted at Kingston Market Place. The clouds parted, the rain stopped and the sun shone… on the righteous (and us too!) It was a rip roarer - and thanks to you all for coming down, eating, drinking, dancing, blogging and tweeting. The street food - Oh the street food! From the capital’s best pizzas, to Wild Game, to genuine Breton crepes to the largest selection of Scotch Eggs on Planet Earth, Kingstonians went mad for it. But, crucially for our family friendly mission, we also had amazing interactive games from the awesome students of Kingston Universe, great sounds from our in-house DJs Culture Cuts and the amazing Albert Ball’s Flying Aces - maybe the coolest 20s ragtime and jazz band in town. It was so popular, people wanted us back the following week, so for summer 2013 we have a number of night markets planned for Kingston: May 2nd is just the beginning. So what’s new at the May 2nd Kingston StockMKT? Healthy stuff: More delicious street eats from Thailand, Korea & Japan. The kind of goodness corporate noodle chains can only dream of serving up. Bad (meaning good) stuff: And, if the idea of ‘healthy’ frightens you, don’t panic we’ll have some of the ooziest burgers in London, unctuous pulled pork and the most fantastic array of sausage products known to humankind. Classy stuff: Cocktails made from proper fresh ingredients by people passionate about their spirits. Sweet stuff: Real Italian gelato, sherbets and sorbets, cakes to die for (and yes cupcakes – people can’t get enough of them, so they’re back). Take home stuff: We have a jewellery cluster, handmade home accessories, plus loads of upcycled and vintage wear from new stallholders. Ear stuff: DJs Culture Cuts and The JC Carroll Acoustic Trio, and we also have some quirky new friends on the bill, throwing their musical magic into the mix!"